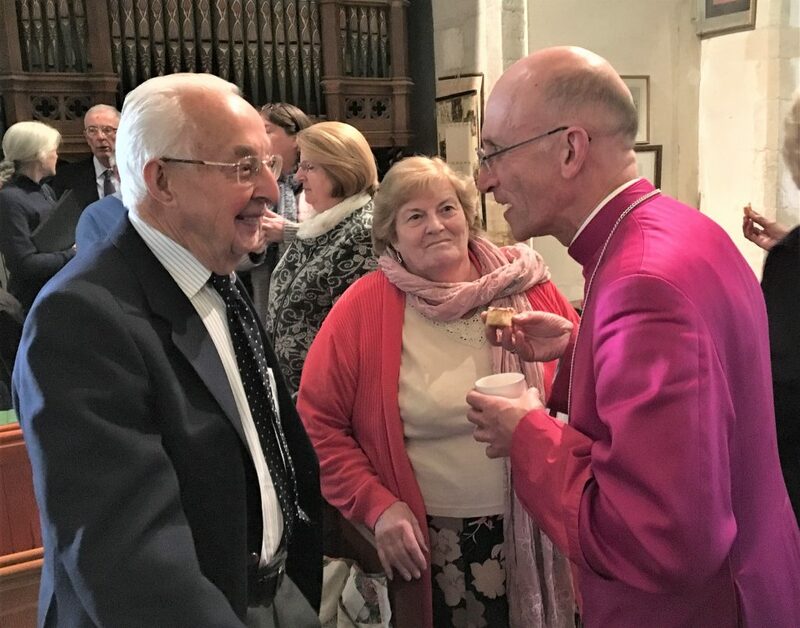 Berwick Church welcomed Bp Martin to celebrate the 75th Anniversary of the visit by Bp Bell to dedicate the first, and largest, phase of the commission on 10th October 1943. Ray West (photo left) who was a child of Grace Higgens, the housekeeper at Charleston, attended the service. He is featured as one of the children in Vanessa Bell’s ‘Nativity’. Bp Martin, who recently gave his maiden speech in the House of Lords in which he spoke of the importance of the Arts, preached about the contemporary importance of the visual arts to society and the church. He said the Berwick commission was ahead of its time and led the way. the contemporary artist breathes life into wall pictures and quickens the dead conventionalities of inherited practice with the fire –the natural action and natural vive. It may well show whether this re-entry of the artist into the realms of religion will prove a part of the general awakening of our time. But it is my urgent hope that Duncan Grant and Vanessa Bell and Quentin Bell and Angelica will take their art further into the churches of Sussex and show the way for other artists to follow. And also that they and their fellow artists will be the heralds of new spiritual birth. 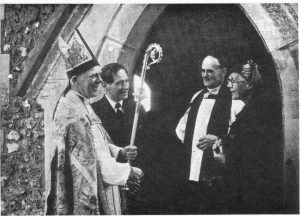 Bp Martin brought the same, recently restored crozier, that which Duncan Grant painted in his ‘Christ In Majesty’ and which Bp Bell carried 75yrs ago. The congregation were encouraged in their challenge to restore the paintings and to continue to promote the vision that the paintings represented of engaging the contemporary artist in the contemporary interpretation of Christianity and to contribute to environment of worship. Sermon by the right Reverend the Lord Bishop of Chichester, preached in Berwick Church on Sunday, 10th October, 1943, being the occasion of the Dedication of the Mural Paintings. Text: Revelation Ch.5 v.13 Every creature which is in heaven, and on the earth, and under the earth, and such as are in the sea, and all that are in them, heard I saying, Blessing, and honour, and glory, and power, be unto him that sitteth upon the throne, and unto the Lamb for ever and ever. Nearly 700 years ago, a man appeared in Italy who became the liberator and renovator of the art of painting. His name was Giotto. The story is told that as a boy he was found by Cimabue drawing on of his father’s sheep with a sharp stone on the face of some smooth stone or slate, and that with his father’s leave he was taken up by Cimabue and trained to be a painter. As a young artist, Giotto was inspired by St Francis of Assisi, who died some 40 years before he was born. His first pictures were painted on the wall of the Upper Church o St Francis of Assisi, and tell the story of St Francis’ life. And some of his greatest pictures were painted on the wall of the lower church of the same place – pictures of the Marriage of St.Francis and Poverty, the Allegory of Chastity, and Allegory of Obedience, and the vision of St Francis in Glory. The century in which Giotto was born –the century of Dante – was one of new life in all manner of ways – new life in which religion provided the supreme inspiration. As a painter – a supreme painter – he played a leading role in the general awakening, and the remarkable thing about the work which Giotto did was this – he was the great humaniser of painting. It is his glory to have been the first among his countrymen to breathe life into wall pictures and altar pieces, and to quicken the dead conventionality of inherited practice with the fire of nature action and natural vive. He was the humanizer of painting, and he painted in the Churches. Last Monday was the 717th anniversary of St Francis of Assisi’s death. We kept is as St Francis’ Day. I am delighted to be dedicating these new paintings in Berwick Church within the octave of his Feast. Once again the painter brings his art to the walls of a church. Once again the contemporary artist breathes life into wall pictures and quickens the dead conventionalities of inherited practice with the fire –the natural action and natural vive. It may well show whether this re-entry of the artist into the realms of religion will prove a part of the general awakening of our time. But it is my urgent hope that Duncan Grant and Vanessa Bell and Quentin Bell and Angelica will take their art further into the churches of Sussex and show the way for other artists to follow. And also that they and their fellow artists will be the heralds of new spiritual birth. The religion of the artist is expressed in the medium of the artist. It is a different expression from that of the priest or the Sacristan, but it may be none the less religion because of that. The artist has his devotions –he worships with his paintings, with his sculptures, with his music, with his song, that is to say, if he pursues his art as a vocation given him by God. I have spoken these general words because I am deeply conscious of the importance of this day and these paintings in the life of the church and the life of the country. I do not think we can easily measure what such a reuniting of religion and art may mean for the spiritual awakening of our country. But the immediate gift and the immediate joy is for Berwick and I should like to say something now to the artists who are neighbours of Berwick and to Berwick people. I am grateful to you, Duncan Grant, Mrs Bell, Quentin and Angelica for the gift and the quality of your work. My hopes were high when the first start was made but in the final result they have been altogether surpassed. The pictures are all – I speak humbly – they form a whole of exceeding beauty. Every bit is alive and has the glow of natural action and natural vive. I am grateful also to Professor Reilly to whom the conception is due, to Mr Etchells, Mr Christi, the generous contributors, the Rector for his unfailing enthusiasm and support at every stage, the Sussex Churches Art Council, and George Elphick the carpenter. My friends of Berwick it is my firm belief that you have one of the treasures of the country in your keeping. Here is something full of beauty and living and simple as well. If you see people you know as people in the pictures – the character of a shepherd or an angel or a bystander, of the Virgin Mary, or Joseph the foster-father, or if you see Sussex country painted in the pictures for a landscape, all the better, because it brings the faith of the birth of Jesus and His life and teaching and neighbourhood home to you today, and shows you that His mother and His neighbours, the shepherds and the soldiers, and the boys and the girls who grew up beside Him in His village then, were just like the mothers and neighbours, the shepherds and boys and girls, the young men and women serving in the forces, living in Berwick and its neighbourhood today. The pictures will bring home to you the real truth and the Bible story – the Bible history – the common everyday life with which that history deals, and help the pages of the New Testament to speak to you – not as sacred personages living in a far-off land and time, but as human beings – just like Sussex country people, with the same kind of human troubles, and faults, and goodness, and dangers, that we know in Sussex today –to whom He still comes, as he came before –the little child Jesus, sent from God to save and to teach and to heal. I hope the children will be brought here to get familiar with the pictures. I hope the young people and their elders, and those who come home from the Services on leave, and all who belong to the Village, will be continually looking in to feast their eyes an their hearts on this truth and this beauty. Note: the Bishop of Chichester hopes that when the time comes to deal with the damaged churches of this country, greater us will be made of the artist’s skill. Further information about this work may be obtained from the Sussex Churches Art Council, Diocesan House, Brunswick Square, Hove, and donations to it will be gladly received and acknowledged by Lord Bessborough at the same address.